NOTE: 256 Test Points Required! This board supports 38-, 76-, and 114-pin surface-mount AMP Mictor connectors. 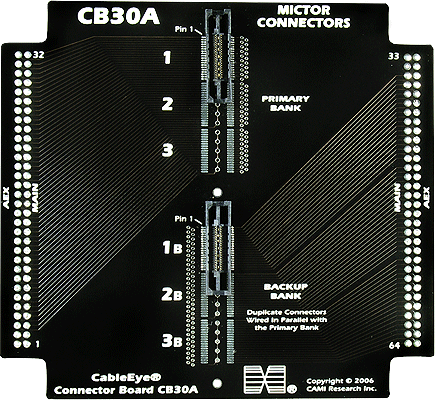 A secondary bank in the lower part of the board provides backup footprints in the event that any of the connectors in the primary bank should become damaged or suffer intermittent connections from wearout. Pad spacing on this board is 0.025" (0.64mm), and the pads are arranged in groups of 38 (19 on each side). These boards ship without Mictor connectors. CAMI Research will solder in connectors provided by the customer if desired, in which case a set of test cables should also be supplied so that we may test the interface before returning it to the customer. Important: These CB30A boards are daughter boards intended to mount on a set of CB30s (see Photo 2 below). Plan on ordering a set of CB30s with the CB30A if you do not already have a set. 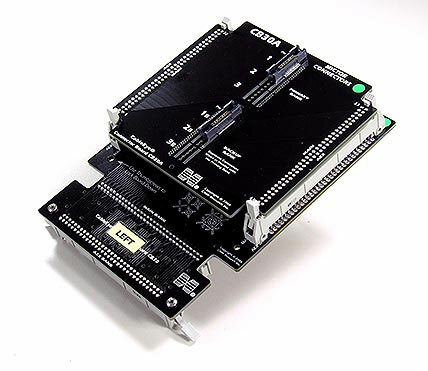 Set of two boards with four 64-pin latch headers. Requires 256 test points and a set of CB30 boards. 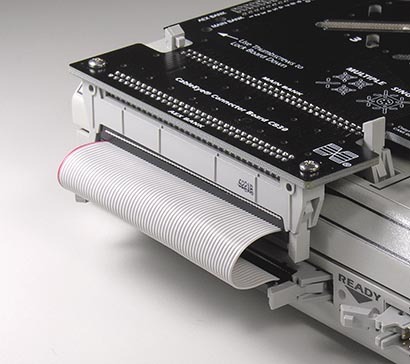 Note that the latch headers should be mounted to the CB30 boards to accommodate the 64-pin sockets on the bottom of the CB30A; CAMI Research will configure this for you if the CB30s are ordered at the same time as the CB30A. 2 - CB30A Mounted on a CB30 Board.